The 2017 American Royal Open Hereford Show took place this morning in Kansas City. 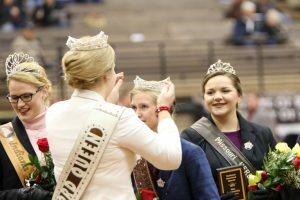 Between the heifer and bull show, the American Hereford Association held a brief program to honor Breeders of the Year, Bulls and Heifers of the Year and to crown the new National Hereford Queen. 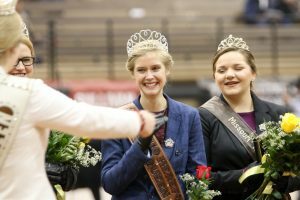 The retiring queen, Annah Dobson from Johnson Creek, Wisconsin, has been the reigning queen for the past year attending many Hereford shows across the nation. Crowned as the 2018 National Hereford Queen was Abbygail Pitstick of Ohio. Pitstick will serve her term as the National Hereford Queen with duties starting today. Candidates were evaluated on multiple things including involvement in the Hereford Association, etiquette and interaction with Hereford breeders. 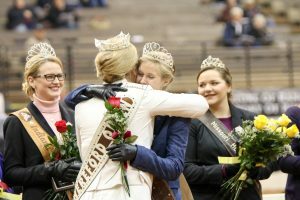 The queen candidates have been in Kansas City this weekend for both the American Royal and the American Hereford Association’s annual meeting. To follow the 2017 American Royal Livestock Show, like us on Facebook or follow the @AmericanRoyal on Twitter. 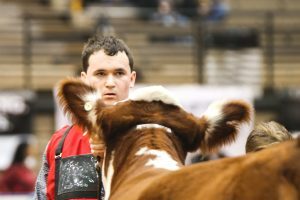 For 2017 American Royal Livestock Show results, click here .